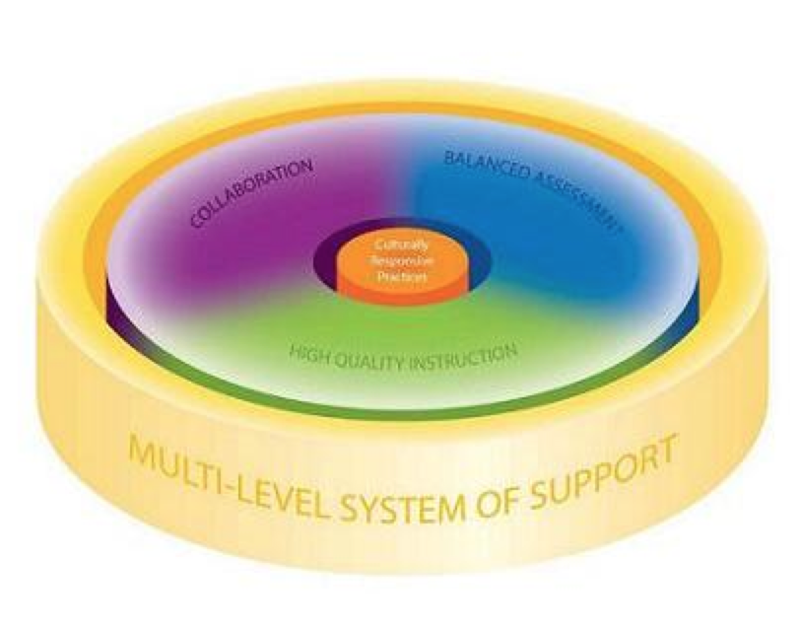 In Wisconsin's vision for RtI, the three essential elements of high quality instruction, balanced assessment, and collaboration systematically interact within a multi-level system of support to provide the structures to increase success for all students. Culturally responsive practices are central to an effective RtI system and are evident within each of the three essential elements. In a multi-level system of support, schools employ the three essential elements of RtI at varying levels of intensity based upon student responsiveness to instruction and intervention. These elements do not work in isolation. Rather, all components of the visual model inform and are impacted by the others; this relationship forms Wisconsin’s vision for RtI. Response to Intervention at the Crossroads Click here for to order online. WSRA’s monograph Response to Intervention AT THE CROSSROADS highlights seminal articles by national and state literacy leaders for thinking about RtI in new ways. These new ideas will raise critical questions and provide insights on how to ensure your RtI approach is moving toward a comprehensive approach driven by expert teachers. Driven by the 2004 Reauthorization of IDEA, the goal of RtI requires optimizing student learning by focusing our attention on appropriate instruction from qualified personnel. Optimizing student learning requires a shift in our thinking about how we have traditionally conceptualized teaching and learning. This monograph provides insights into this mindset shift. Click here for an article on kindergarten. Click here for an article on DIBELS. Click here for an article on oral language. Mythbusters! The Wisconsin State Reading Association has received numerous questions regarding the implications for literacy as a result of Response to Intervention systems and the Wisconsin Specific Learning Disability (SLD) rule. The ESEA/RtI/Assessment Task Force has been investigating these issues and working with DPI and experts in the field to explore them. This information is intended to help our members wade through the large amount of information available and recognize the misinformation and misinterpretations regarding these topics that are proliferating throughout the state. We are currently working on answering additional questions and will be adding those as they become available. The questions in this document have been received from members throughout the state based on things that are currently happening in districts/schools. The answers have been developed using the best available evidence from state documents and professional literature. We have also provided excerpts from and links to many of the documents for the convenience of members. 1. What is the difference between RtI and SLD rule? To whom does this rule apply? 2. Can I use an intervention that addresses more than one of the areas of SLD? 3. In the Wisconsin SLD rule, "Intensive interventions" are defined, in part, as focusing on single or small numbers of 'discrete skills'. What is the definition of discrete skills? 4. What constitutes an intervention that meets the SLD criteria? 5. Is the standard protocol approach within a 3-tiered model the only appropriate way to implement RtI? 6. How is the WI model for RtI different? 7. Who should be a member of the SLD referral team? What is the role of the reading teacher/reading specialist? 8. Who is the SLD rule for? What about the children who need ongoing support to be successful? 9. What is meant by exclusionary factors? 10. I see many different opportunities to learn about RtI and the SLD rule. How do I determine which are high quality? 11. Are districts required to have an RtI process in place by December 1, 2013? Is the implementation of RtI mandatory in Wisconsin schools? 12. Do we need an intervention block in our school? What is the nature of the evidence of the intervention block?